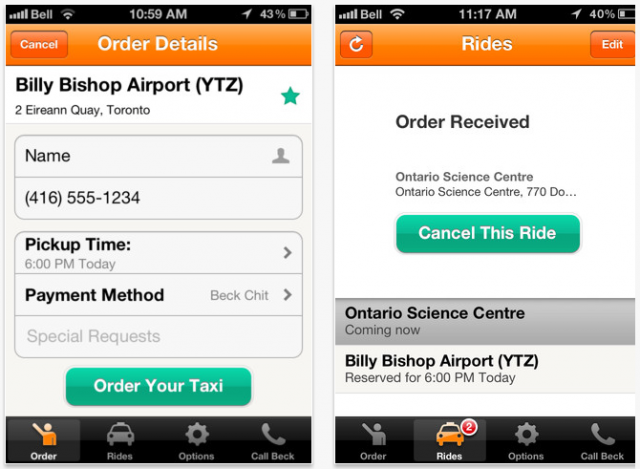 For some reason if you’re in Toronto and can’t find a taxi, specifically any one of the 1,650 available Beck Taxi cabs, then you’ll be all over this iPhone app. The Beck Taxi app is for those who don’t want to call the dispatch and is “Toronto’s First Taxi App” that allows you to order a cab within “two clicks.” This is different than the #TAXI app that costs between $1.25 and $2.00 per call, the Beck Taxi app is free. It’s basic and uses the GPS in your phone and gives you various landmarks for the cab driver to meet you. You can schedule a pick-up for a later time (up to 30 days in advance), and also gives you the option to put in favourite locations. Probably the best feature of the app is that Beck will give you status updates confirms your order and when the Beck Taxi is estimated to arrive.